When my sister told me abut her latest risotto discovery from her trip to Italy, she sounded so thrilled that I couldn’t wait to get the pot on the cooker. 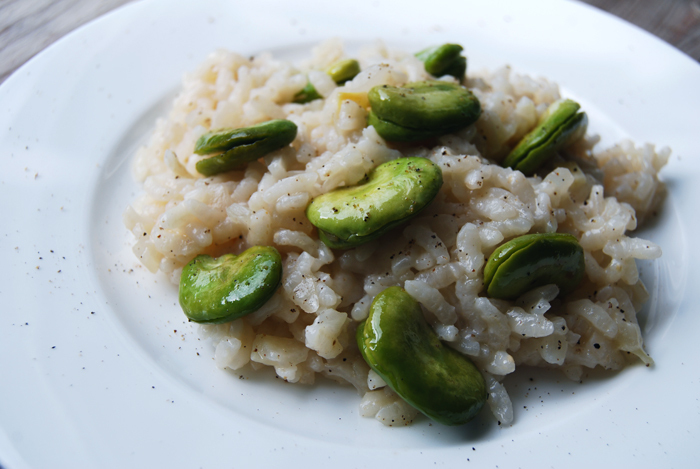 She was talking about a parmesan risotto which by itself isn’t necessarily spectacular but this one is different. 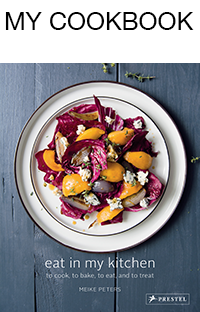 It’s made with bigger pieces of cheese which are stirred into the creamy rice when the risotto is done. 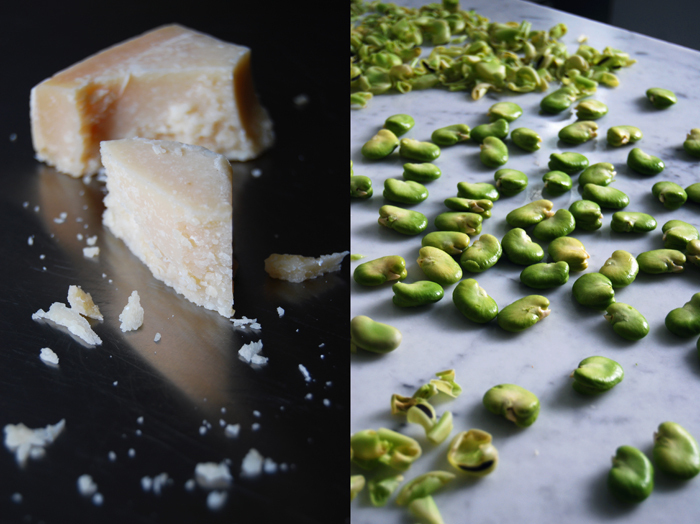 The parmesan melts, partly, but a few crumbs keep their crunchy center which makes it taste stronger, more concentrated. I was absolutely impressed, this method of preparation lifts parmesan risotto onto another level! 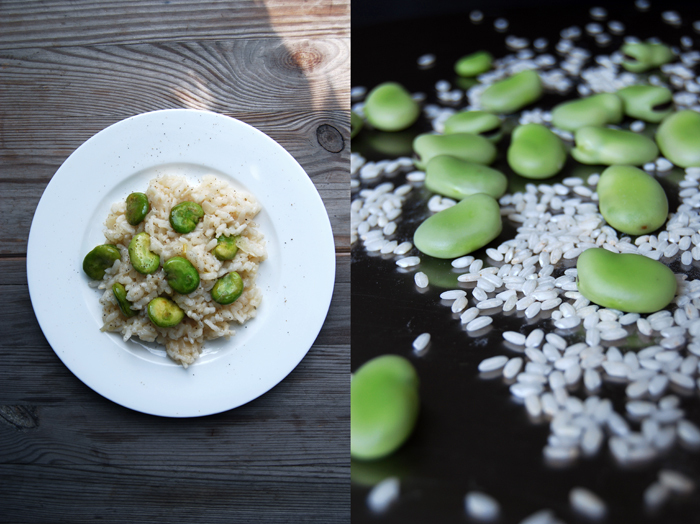 I had some fava beans left on my window sill which I added to the rice, I prefer to have some vegetables with my risotto. Be it a simple salad or some sautéed greens on the side, I need my vitamins as much as my carbohydrates! I fried the beans with some garlic, deglazed them with white wine and let them simmer for a few minutes. I wanted them al dente, a crisp topping for my smooth risotto! I cooked the risotto with the water I had used to cook asparagus in a few days ago. It’s a light broth which I always keep and freeze, great for recipes which need a soft vegetable aroma. In a large pan, heat a little olive oil and 1 tablespoon of butter, add the garlic and beans and fry on a medium heat for a few minutes until golden. Deglaze with half of the wine and let it cook for a minute. Season with salt and pepper and add the rest of the wine, close with a large lid and let it simmer for 5 minutes or until al dente. Season with salt and pepper to taste. In a large pot, fry the onions in a little olive oil and 1 tablespoon of butter until golden and soft, stir in the rice and fry on a medium heat for a minute. Add some of the broth, the rice should be covered, stir and turn the heat down to medium-low. When the liquid has been absorbed add more broth, a little at a time stirring in between. Depending on the rice, it needs more or less liquid. When the rice is al dente and the broth is more or less absorbed take it off the heat, season with salt and pepper to taste and stir in the parmesan, close with a lid and let it sit for a minute. 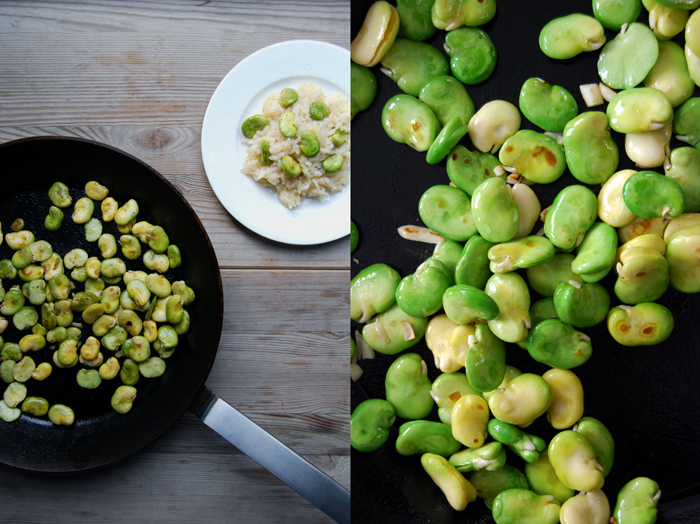 Arrange on plates together with the fava beans. Fabulous combination. I love all the ingredients!